Mainly enjoyable recreational athletes feel comfortable on the picturesque slopes on the Fiescheralp. And even more varied runs are accessible for you, due to connections to Bettmeralp and Riederalp. Remember: Safety already starts before putting on your winter sports equipment. Therefore, your equipment is set and tested by modern facilities. 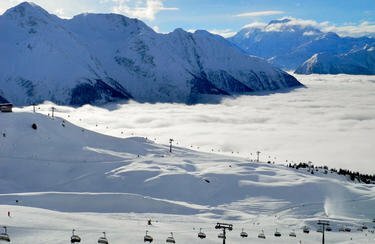 The INTERSPORT Rent team informs you in detail about what is required on your ski holiday and provides you with essential safety tips. You can find excellent equipment for sale or rent and functional winter clothing that guarantees that you wont sweat or freeze at the ski rental of INTERSPORT Volken Sport Fiesch / Fiescheralp: Ski jackets and pants adapt optimally to the winterly coldness and your sportive workout. The trained team at INTERSPORT Rent consists of real professionals who are specialized in repairs and maintenance of your equipment: Your skis and snowboard are brought back into shape In the modern tuning center with grinders of latest technology. Get useful information for your holiday in Fiescheralp to your mobile!